I wanted a simple mod to randomly cast a mount from a list I defined. Using Land in nonflyable areas and flying in flyable areas. Have added localization ability, tenatively/hopefully. If you would like to localize this, please look at localization.enUS.lua and send me a comment stating you would like to. Have added the ability for druids/shamans to use their travel/GW/flight forms. It's bound to a 3rd key binding. Can not be part of the randomness due to the fact it is a spell and must have a secure button to cast. Well it could be just not simplified. For druids, will attempt to cast swift flight than flight form in flyable area's, if you have neither it than will attempt to cast travel form. If your not in a flyable area it will attempt to cast travel form. Ok to be able to cast, the binding is transfered from the trigger you set in Key Bindings menu, to the secure button for casting. So each time you log in you will have to hit this key binding twice, but for the rest of the session will act like a regular keybinding. I have found no way around this at this time. This only affects travel forms keybinding. Comments Suggestions always are welcomed. /rdm catform -- if you are a druid will use catform in instances/inside. If you have any bugs, questions, comments, suggestions, please leave me a comment. I did run into a mount that doesn't have the same name in the tooltip as in the WoW API call. Bronze Drake from CoS timed, doesn't have the word mount in the tooltip, but in the API call comes back Bronze Drake Mount. If you get an error saying mount doesn't exist, please let me know. Also if you ahve the HHM, will you let me know if it works with this? I don't think I can add a mount before it's released in game I guess. Warforged Nightmare fixed. Added Iron Skyreaver to ground/flying. Sky golem can now be used at land mount. Tweak swimming detection for the use of the turtle. Add an "Enabeld" mount panel that lists all your current used mount. Bump toc version for patch 5.4. Update the mount list for patch 5.4. Bump toc version for patch 5.3. Update the mount list for patch 5.3. Bump toc version for patch 5.2. Update the mount list for patch 5.2. Bump toc version for patch 5.1. Same name mount should not bug anymore. Completely rewrite setting panel based on Ace3 (your save mount has been remove). Update localization string (based on Ace too). A lot of code rewrite. Remove reseed function because it's now based on mount name. Fix issue with mount name which is not the same as the corresponding summon spell (jewel crafting ...). Fix an issue which prevent addon to load. Add help to landonly slash-command. Jeweled mounts are now usable at land mount. 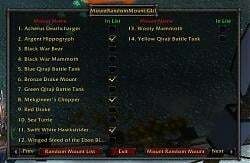 The red flying cloud are now usable at land mount. 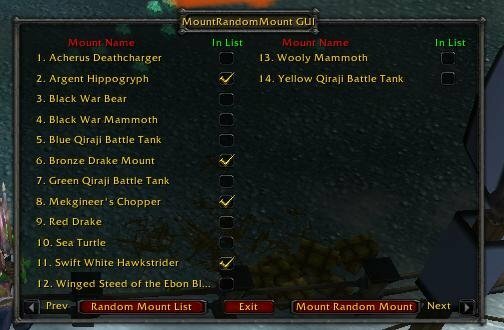 Fix an issue with the list of mount on blizzard UI which is not ordered alphabetically which cause wrong mount to be summon. All Hippogryph are now usable in land mount. The Imperial Quilen is now also usable in land mount. Added patch 4.3/TCG Mounts to the List. Please report if any missing. Added new mounts from patch 4.2 (if nothing changes) and the new mount from Blizz store. Added new mounts from patch 4.1. Updated ToC. Added translation for RU/FR/DE for the 3 area's that can use the Seahorse mount. Still need zhTW translation from someone (wowhead doesn't have a zh. or tw. that I could find to get the right translations. Fixed worgen (i think anyways). Fixed Seahorse for other clients once I get translations. Added Worgen Ability to go with the other racial abilites (druid/shaman). Fixed adding removing mounts with the command line. Not much just a bit of debugging to help a user figure otu what's going on. Fixed random code, added seahorse mount for Vash in cata, fixed better swim mount detection. Better detection if able to fly or not. Wow, that change had some errors. Sorry about that. Fixed errors. Changed GUI. Allowed combo mounts (celes/HHM/etc.) to be in either or list or both. Added lomoko's Russian translation fixes. Changed how mounts are determined for flying/land as the coming changes in Cata. It now keeps a global list of all mounts and what they can do (land/flying/both/swimming). Added ability to summon flying mount when swimming but at the surface. This does not work with the Druid Flight ability as it seems they still check for swimming with druid Flight Form. Added French Translation, Thanks to WoWInterface User Tomate. Added being able to exit vehicle with same button to dismount. Thanks to Gandoch. Fixed removing mounts from both lists when land/flying mount. added Female Shaman for Ru, if German or another client needs this please let me know. Fixed the error printing where it didn't need to. Added German Translation thanks to Brenainn. More German Translation by mad-d and Russian Translation by lomoko. More German Translation by mad-d and Russian Translation by lomoko. Added error checking when using command line to add mount. Added german translation for wintergrasp. Added X53-Touring Rocket. Added Aufenthaltsort for german translation (location) for celestial steed and if in german client they start adding this for mounts that can be used everywhere (unfortunately, english has location for HHM/Celestial steed, but german didn't until Celestial Steed). X-53 should work across all clients, as X-53 is not a word. Added Sea Turtle cast if swimming to random mount, otherwise a land mount is cast. Added Acquatic form if swimming and druid. IsFlyableArea Does not work during Combat in WG, added code to correct this. IsFlyableArea() was fixed in 3.2 and properly determines if you can mount. Simiplfied code this way. Minor fixes to color code. Fixed issue with next button on GUI not re-enabling when prev button was pushed, until page 1 was reached. Updated so no error message (found the API call to find out if WG is in combat and was able to see that land only during combat, flying every other time, even if other faction owns WG, sorry took me a bit to have time to test). Updated Druid travel forms for WG hopefully, need someone to test. Updated for flying mounts in WG, what it does is try to mount a Flying mount then a land (in case of battle). So you will get a message another action is in progress, or you can't use that here and a land mount is summoned. Unfortunately, this is due to the fact that CallCompanion doesn't return anything (ie success or fail). Also, i did this cause I wasn't sure if you can mount you flying during WG battles. Been busy, haven't been able to test. Fixed code for the druid forms again. Hopefully fixed the profession only mounts and headless horseman mount. Hopefully re-fixed the druid forms. Was pointed out to me, that I shouldn't use global variables, but use a table. This has been fixed. However, your mount list will now be blank. Hopefully fixed the druid forms. Hopefully fixed the cat form inside toggle command. Also added a check if the player is a druid, so it will just tell you to ignore that command if you are a druid. Hopefully fixed the not using flight form in flyable areas. Added localization, enUS only right now. If you want to contribute another language, please look at the localization.enUS.lua file and there are all the variables used within MRM. Send me a comment that you would like to do this. Added shaman/druid ability to use GW/travel/flight forms. It uses a 3rd binding for this, since they are considered spells and not mounts, a secure button must be used. So they can't be part of your random list. The 3rd key binding will show up for non druid/shamans but if you set a keybinding to it will display a message you aren't of the right class. Fixed the problem with not mounting up a land mount if you had no flying selected. Added a command to reseed mount ID's. If you play on 2 computers and you learn a new mount on 1, your list on the other won't work correctly until the ID's are corrected. This will do that. Was not correctly updating your list when a new mount was added. Fixed. Will have to clear your list or add a new mount. fixed an error where no printing of what mount was added when your flying or land list is empty. Changed it so that a flying mount would be used in Krasus' Landing in Dalaran. I will have to look for another Macro, cuz i hate Modifier Macros. The main problem is keeping the mount DB updated. And with all flying now ground, but not all ground flying, the whole DB needs a overhaul. And since the built in functionality works exactly how i want it, I don't see a reason to spend my time doing that. Sorry. I wish you luck in finding another option that fits your needs. So this Addon is Abandoned then? The built in functionality works for me. I will probably be abandoning this myself. I'm looking for a random mount addon that will work on the beta and thought I'd chime in here. Currently, WOD's random mount function does not allow multiple profiles. All 'favorite' mounts are shared with all alts - including both factions. I will not do a version for WoD beta. The functionality you are referring to is different to what's MRM do and this functionality should be done in another addon. I will maybe do a profile addon for mounts but currently I haven't time to. If that's true than I would probably stop development also. Personally I don't think I will use MountRandomMount with 6.0 because blizzard add a build-in functionality similar to MountRandomMount. Indeed, if I don't use it I will stop doing update. I am not the author so maybe he will continue updated it. But maybe the build-in functionality will not be good enough. I can't see the mount "Enchanted Fey Dragon" on the list Ground Mount but I can see this mount on the list Flying Mount. How to fix this? Thanks. Or you can wait till I upload a new one. Waiting for the 2 new mounts for 5.4.8. Should be fixed next update. Forgot to add it to ground mount list. Going to have to rewrite addon in WoD with all mounts (except swimming only) being able to be ground mounts. Just seeing if I can get this working. Don't expect anything.